First of all, Wikipedia has done more for me over the years than anti-fungal ointment, and depending on if you smelled my shoes when I had athlete’s foot (actually, if you were in any enclosed space with my shoes, you most likely did smell them), that’s saying an awful lot. 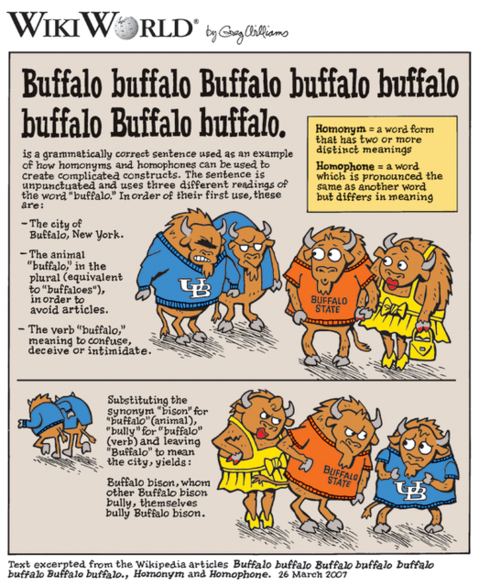 I’m totally using that for a class, because in the Thai language, calling someone a buffalo is a hugely insulting and funny thing, and “buffalo” is one English word every Thai person knows. Just mentioning it in class will produce immediate and long-lasting laughter, for students of any age. So I’m afraid it might take a whole class to parse this sentence properly. Which is a perfect pangram– using all 26 letters in the English language once (and just once). I’m cutting and pasting the meaning here: “grassland wryneck causes charitable-land hybrid cattle buck to mount”. Veldt is open grassland in South Africa, a jynx is a wryneck bird, to grimp is to cause something or someone to mount, waqf is land given to a religious institution for charitable purposes in Islamic countries, a zho is a hybrid bovine animal bred from a yak bull and a common cow, and a buck is a male member of a species. My mom’s brother-in-law called us all buffalos and my Grandmother hasn’t spoke to him in 10 years! LOL… I think it’s only insulting if you mean water buffalo. Previous PostPrevious Max, bring the beat!